More and more research shows a connection between hearing loss and cognitive issues like memory loss. Hearing loss has been shown to create a series of stresses on our cognitive functioning that may encourage the development of serious health issues like dementia. Now, a new study is coming forward that reveals how some of the signs of dementia may actually be signs of untreated hearing loss. Hearing loss and dementia are two vastly different conditions, but surprisingly the signs of one may be confused with the signs of the other. Being unable to retain and organize information, a perceived lack of attention and difficulty recalling what has been said can all point to the cognitive disturbances associated with dementia. Equally as likely however, these indicators may be signaling unaddressed hearing loss and the way it makes comprehension and communication more difficult. A study just published from the Baycrest Hospital in Toronto, Canada has shown there is an interesting overlap between those with hearing loss and those facing cognitive issues like dementia. Following patients being evaluated for cognitive diseases, the study looked at the prevalence of hearing loss. What they found was quite interesting. In the patients having their cognitive health reviewed, significant hearing loss was found in 56% of those in the study, more than half of everyone seeking evaluation. Despite this high percentage, only a mere 20% of those in the study wore hearing aids to treat their hearing loss. The connection between hearing loss and cognitive issues has been established within other medical studies, however the full picture of how the two conditions are tethered to each other is still emerging. The recent findings in the Toronto research highlight the importance of screening for hearing loss when testing cognitive and memory issues – the signs of hearing loss can often be taken for cognitive problems. Hearing loss deeply affects the way we perceive the world and how well we are able to communicate with others. It limits how well we comprehend what is said. This issue with comprehension can result in behavior that mirrors some of the signs of memory issues. Problems with comprehending simple directions and recalling information inaccurately are often what brings people to seek medical help for memory problems, especially Alzheimer’s disease and dementia. However, both comprehension and recall may be rooted in hearing loss rather than cognitive issues. If information is not fully heard when it is presented it will, of course, be more difficult to recollect and repeat correctly. Similar problems arise with lapses in attention. Often those close to a person with hearing loss will interpret an inability to hear as difficulty with paying attention. In fact, hearing loss can make it difficult for a person to recognize when they are being spoken to. Undetected hearing loss can also negatively influence the results of verbal and speech-based neurological tests, which means untreated hearing loss can worsen a person’s performance during evaluation. Until auditory exams become a precursor to neurological evaluation, this issue may persist. 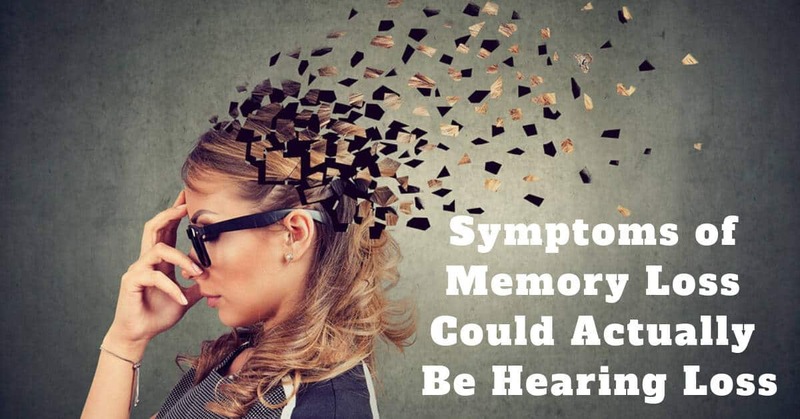 In addition to causing issues that resemble memory concerns, hearing loss need to be addressed because it can have a big impact on cognitive health. Hearing loss essentially creates extra work for the brain to do, work that ultimately taxes cognitive performance. When we can’t hear completely, the mind has to scramble to piece together the incomplete information and comprehend what is said. To do this, a person with hearing loss pulls mental focus onto hearing and shortchanges other cognitive processes. This mental strain can have serious consequences – for example, hearing loss pulls mental resources away from balancing and coordinating our body. The result is that people with untreated hearing loss have a much higher likelihood of accidental falls. The cognitive stress that hearing loss places on the brain may have some connection to the development and severity of dementia. Untreated hearing loss has been shown to significantly increase a person’s risk of developing dementia. The evaluation and treatment of hearing loss is now becoming more understood as an important step in neurological diagnoses. Treating hearing loss has been shown to improve cognitive functioning in both people with and without dementia. For people being evaluated for dementia and cognitive disorders, treating existing hearing loss improved their performance on testing and often resolved the perceived memory issue. In patients with dementia and hearing loss, treating hearing loss with hearing aids improves performance on cognitive tasks, comprehension and mood. If you have experienced changes with your hearing and suspect you may be living with an untreated hearing loss, contact us at Hearing Group today for a consultation.